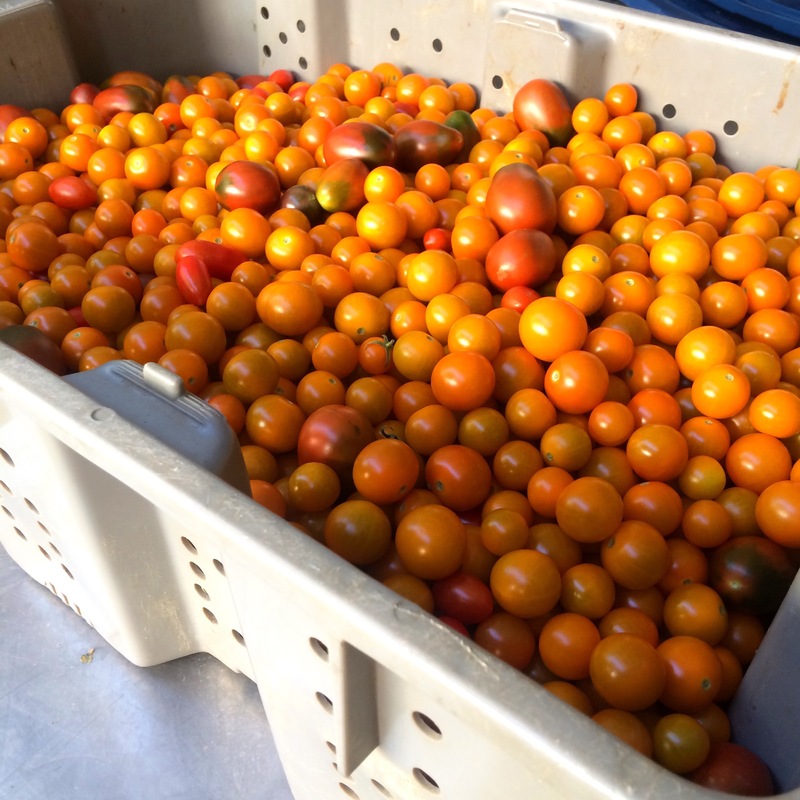 ARTfarm Q&A Wednesday 3-6pm: Hold My Tomatoes! 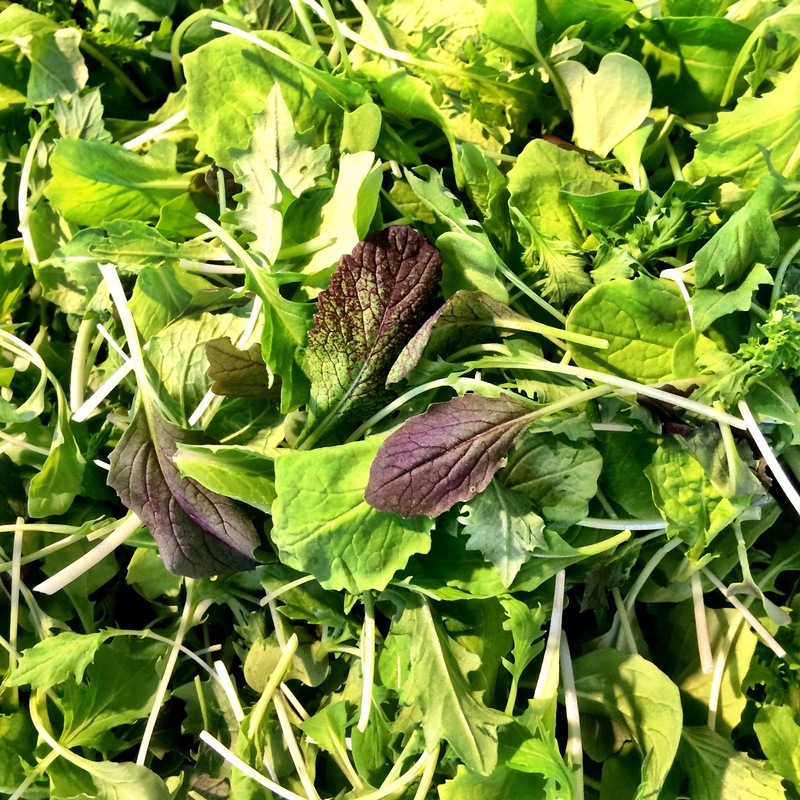 Today’s farmstand, 3-6pm: Sweet salad mix, baby spicy and regular spicy salad mixes, baby and regular arugula, microgreens, loads of cherry tomatoes, loads of tomatoes, onions, scallions, beets, Italian basil, Thai basil, dill, cilantro, parsley, purple Bodhi beans, assorted chili peppers, a couple cucumbers, baby carrots, escarole, a few bunches of kale, delicious Mediterranean figs and passionfruit. 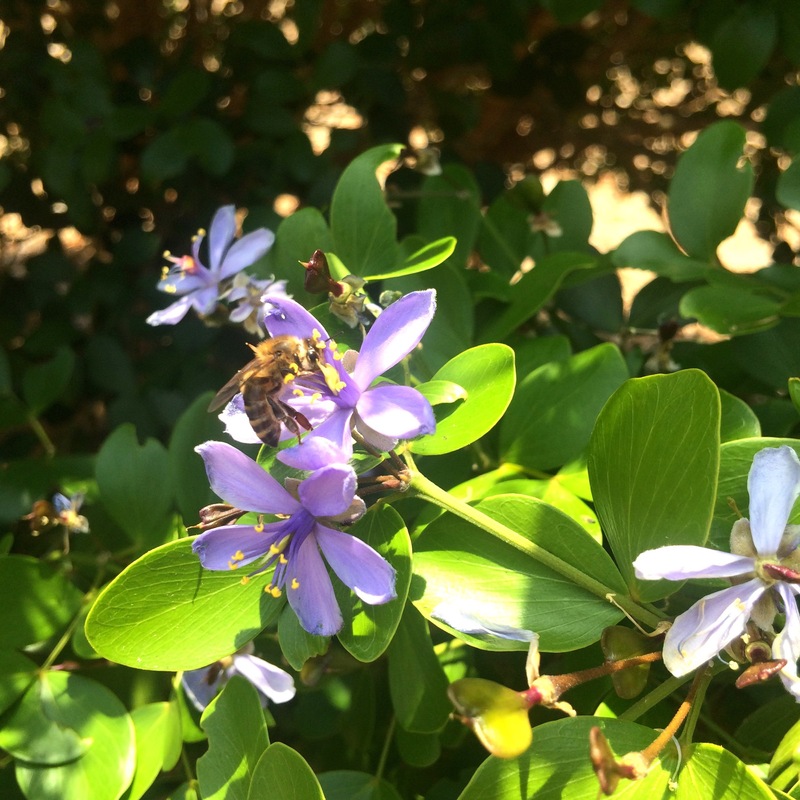 From our partner Errol Chichester’s beekeeping efforts we have local raw honey! Radishes! Carrots! and Beets! Oh My! It’s the scarecrow, the cowardly lion and the tin man. At the end of the yellow brick road, there was… freshly harvested MICRO! 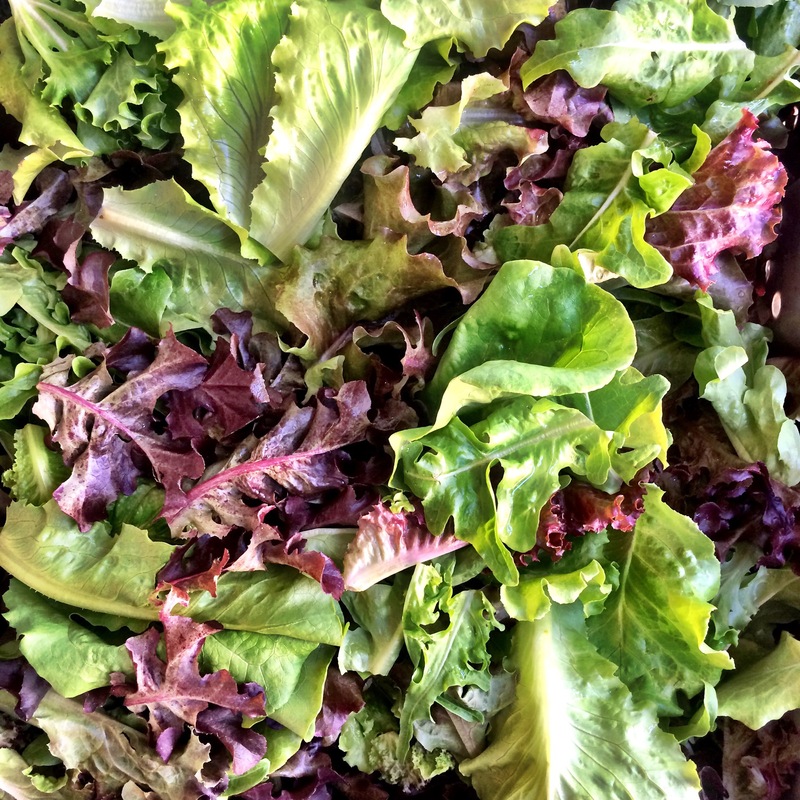 Fresh oakleaf lettuces destined for ARTfarm’s sweet mix! Q: Can you hold a couple of pounds of tomatoes/some dill/a few cucumbers/a bag of salad for me? I can’t make it to the farmstand on time today. A: We hate to say no to good people. We love all our customers and supporters. 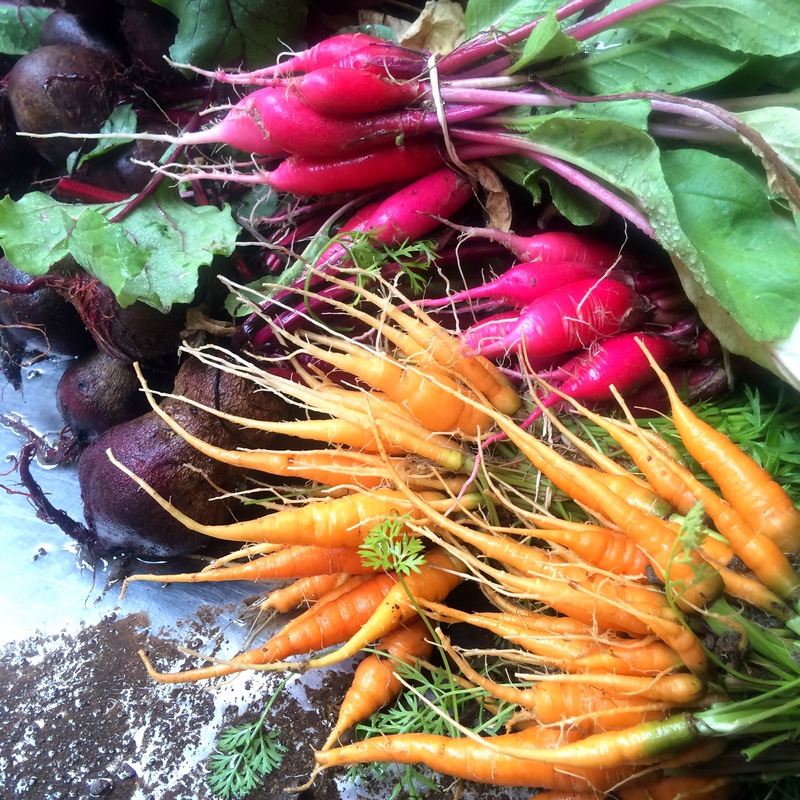 We appreciate and applaud how important fresh, organically produced food is in your lives! This is one of our most common questions – we field several requests per week from customers to hold items from the farmstand. 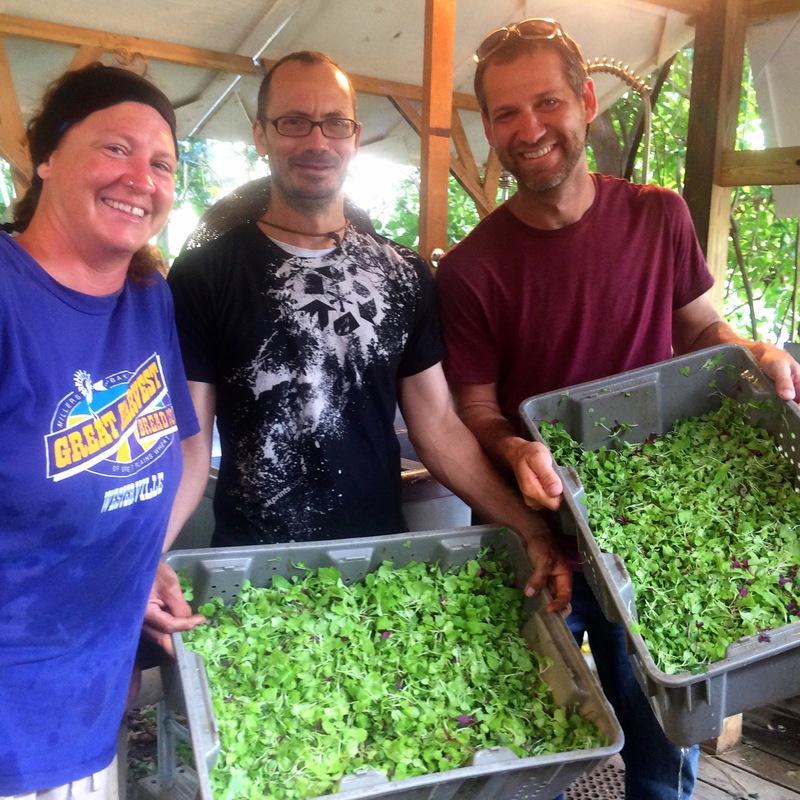 Our policy for retail sales has always been that we are a first-come, first-served farmstand. We may have good intentions and want to say yes to you, but we do not have the manpower, the infrastructure, the time or the space to set aside produce on request. If you start to consider the logistics, we simply can’t accommodate custom retail pre-orders. We lose money on them. And they’d reduce the early-bird limited-supply offerings we want to have available for customers who came on time or even waited in line. We are a family farm – mom, pop, and grandpa – with a couple of part time employees and loyal volunteers. Maybe someday we’ll be bigger with more staff, but for now we are tiny. We work literally from pre-dawn until after dusk, six to seven days per week year round, to care for the gardens and livestock and accomplish what you see at the farmstand and appearing on the menus of local restaurants. 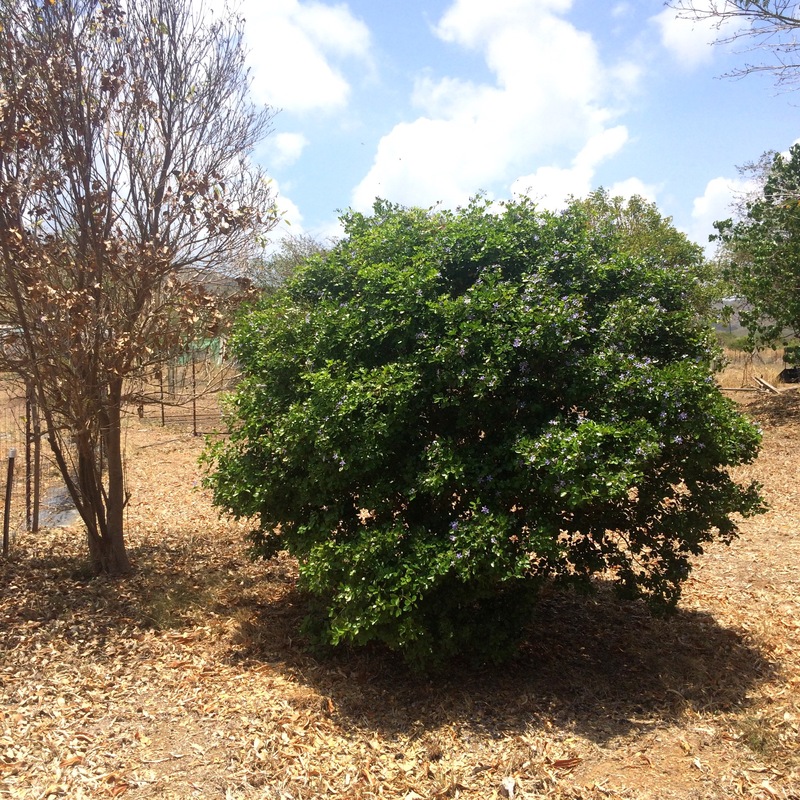 Our profit margins are narrow because of all the labor costs and handwork that goes into our harvesting and processing work and our organic gardening and resource conservation techniques. We love what we do and are dedicated to it, but it leaves us with very little downtime. Additional tasks and projects pull Luca and Christina away from the art studio. We have to limit the services the farm can offer. We ARE open three farmstands per week in winter and spring, and at least once a week through most of the summer/fall months. 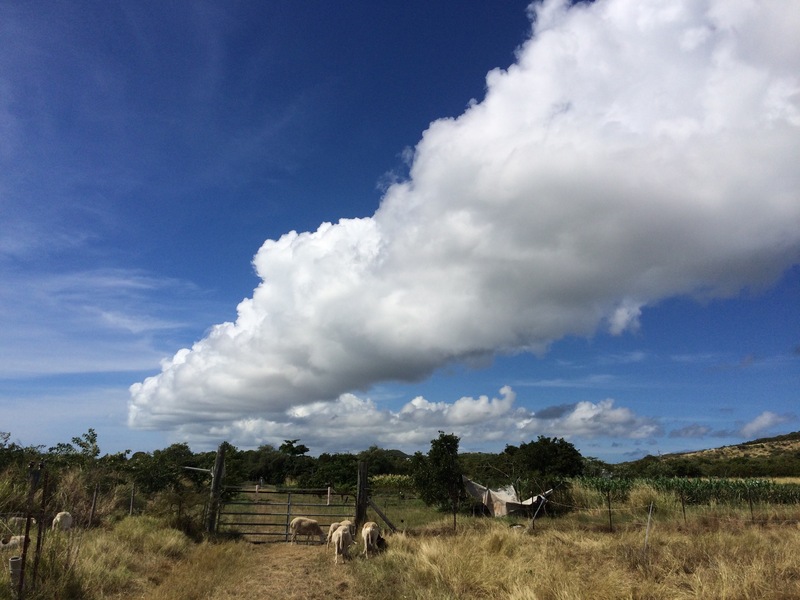 We live in a modern world that values efficiency over all else, but coming to the farmstand is, we hope, a qualitative experience and not just another errand to rush through. If you can’t make it, there is always the next farmstand… we, and our family and friends, thank you for understanding and appreciate your support! Monday Q and A, open 3–6 p.m.! 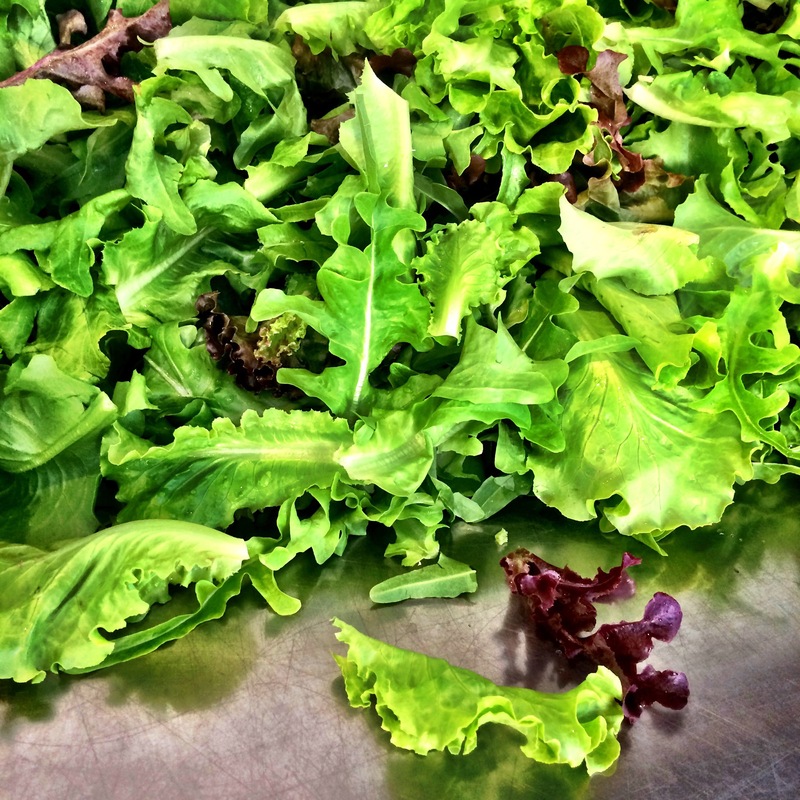 Fight the Monday doldrums with great piles of gorgeous greens and crunchy veggies! 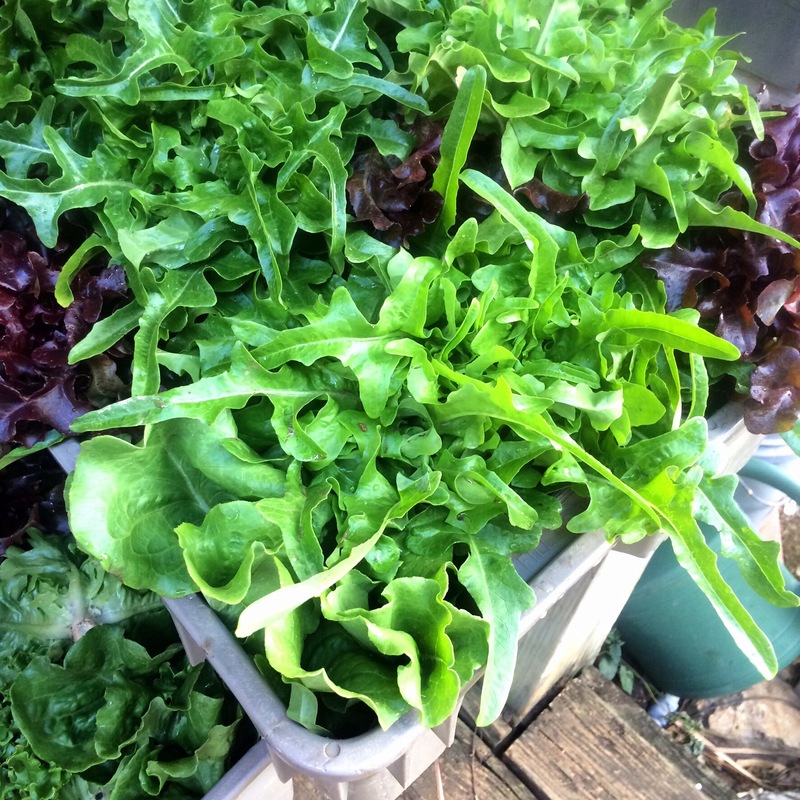 Today’s 3 – 6 PM farmstand: loads of sweet salad mix, teen arugula, spicy salad mix, Italian basil, cilantro, a tower of multiple big tubs full of heirloom tomatoes, slicing tomatoes, cherry tomatoes, Bodhi beans, garlic chives, fresh ginger root, beets with big leafy edible tops, beautiful chili peppers, dandelion greens, scallions, passionfruit, Mediterranean figs, and freshly harvested zinnia flowers. From our partner I-Sha we have locally crafted vegan ice cream! How many heirloom tomatoes can YOU eat? Please, HELP US!! 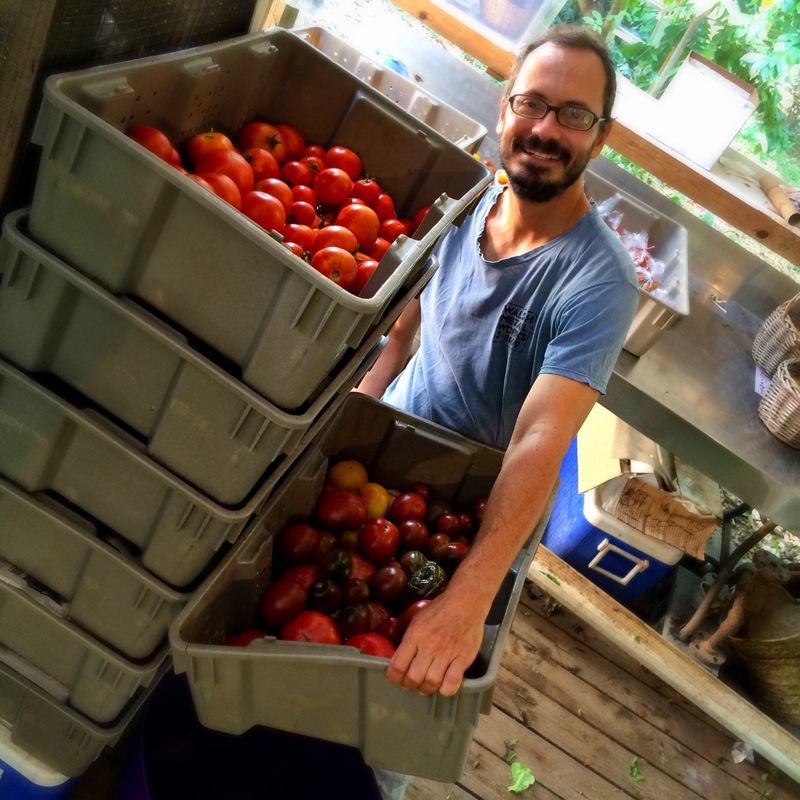 Q: Farmer Luca, why do you look so sleepy in this photo of you with a giant tower of tomatoes? A: I’m glad you asked. In fact, I have been up late for the last few nights. After putting excessive numbers of tomatoes to bed, I’ve been grooving to golden age hip-hop and working on paintings for a new art exhibit I will be having with Mike Walsh at the Walsh Metal Works Gallery, opening April 10th! So, dear customers, when reaching for a bag today for your purchases, be careful not to mistakenly grab one of those under Luca’s eyes. Monday Q&A with Farmer Luca! Open 3-6pm Today! Q. What’s your favorite thing to do with lots and lots of cherry tomatoes? A. Besides snacking on them like popcorn, they can be great in recipes that call for cooked tomatoes. Take a few pints of cherry tomatoes, rinse and toss them with some crushed garlic and olive oil and roast them in the oven until they begin to soften and wrinkle a little. If you like anchovies, you can also mash a few of those into your olive oil and garlic dressing to help cut the sweetness of the cherries and add a little saltiness. (Most classic tomato sauce recipes call for a little sugar, but in this case, the sweetness is already in these little teeny tomatoes.) Once they’ve roasted and started to wrinkle a bit, run them through the food processor or blender until the skins and seeds have been pulverized and you’ve achieved a creamy and smooth consistency. We use a Vitamix – and you wind up with an incredibly delicious and creamy tomato sauce/soup that even little kids and people who say they hate tomatoes will love. You can bag it up in plastic zipper bags or your container of choice and freeze, or get out your mason jars and can this delectable creation, or use it immediately topped with a few leaves of basil and maybe some fresh Parmesan in a bowl or on a pizza or pasta dish! Monday’s stand: Buckets of cherry tomatoes. Sweet salad mix, teen spicy salad mix, teen arugula, microgreens, tons of tomatoes (all types and sizes), cucumbers, Italian basil, cilantro, garlic chives, ginger root, long beans, radishes, mint, recao and zinnia flowers. And loads of homemade coconut vegan ice cream from I-Sha in crazy local fruit flavors! Things were oddly quiet on Saturday, so we hope we didn’t scare anyone off with our roller derby joke! Looking forward to seeing you this afternoon, 3–6pm on the balmy and blue skied South Shore!